1. This is a sequel and should be treated as such. When it comes to book series, I have a pet peeve: they should not be compared to each other. I don’t believe Mockingjay should be compared to The Hunger Games; they are two completely different parts of an overarching story, but they are different. I believe that goes for this series too. The Burning Sky is extremely different from The Perilous Sea. The pacing in this book is different, but GREAT! It flops between two time periods, which threw me off at first, but then became absolutely awesome! 2. Adult characters have a roll too. What I loved most about this book is that they gave an adult character a very important roll instead of leaving them all to teenagers. 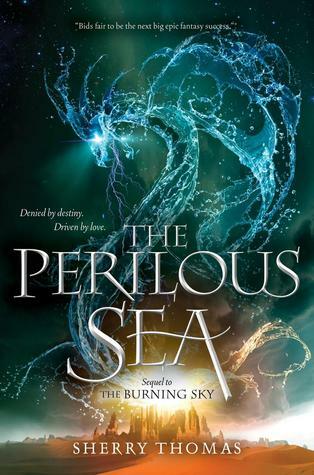 I think in YA lit, we sometimes forget that adults have rolls outside of parents and totalitarian regimes, and The Perilous Sea actually worked with that and utilized adults as major plot twists and gave them characters that would actually help their cause. I can’t say who this adult character was, but I will say that I am happy that Thomas put that character in this book. Oh my god. That finale. It was a fantastic last three pages. It ended with a major cliffhanger and will leave every single reader begging for next September. A more fantastic ending, I could not ask for. I was extremely impressed with how Thomas brought together two slightly different story lines and melded them so brilliantly and perfectly. Overall, this is a worthy sequel. I loved the first one, but I was happy that this one held such a different and incomparable pull for me. This was a different side of their story, and I loved reading every minute of it.